This past weekend Carla, Bonne Bouche, and I went to visit my parents. I brought three new cheeses, all made from raw milk. We had a cloth-wrapped cheddar, a small wheel of blue, and a stinky little washed-rind disc. The cheddar was my experiment to apply a thick coat of butter over the rind, along with two layers of butter muslin. I normally use a small amount of butter to help the muslin adhere to the cheeses, but I noticed Grafton uses a huge quantity of butter on the rind of their clothbound cheddar. So I laid the butter on pretty thick, in hopes it would help to keep the cheese moist, but still allow the cheese to develop a full, earthy flavor you can't get with wax coating. And it seems to have worked! The cheddar was moist, flavorful, and flaky, but still melted creamily on the tongue. I made two 3lb wheels when I made this batch, so I'm going to let the other wheel go another 3 months or so to see how it progresses. The second cheese we opened was my blue, which has a furry gray rind from the addition of mycodore cultures. 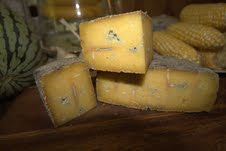 Mycodore was suggested to me as a way to keep my blue cheese moist and quickly develop a natural rind. Although I've later read that mycodore is very temperature and salt sensitive, which might be why it took 2 weeks to really "sprout" on my cheese. But the disappointment came when I opened the cheese, as it had very little blue veining throughout. It looks like the cheese really closed up, with few air pockets for the blue mold to bloom. This was the same problem I had with my first cheese, so clearly I'm not handling the curd correctly. It tasted great, but more like a fresh farmhouse cheese with a tangy flavor and only a slight blue bite. This was a cheese I also made a double batch of, so we'll see how the second wheel looks after another 2 months or so. Lastly, we opened my washed-rind cheese. This is my first cheese using PLA cultures, which are supposed to give a rich, gooey cheese with a noticeably funky flavor. I was a little worried, as it had a few small cracks in the corners of the rind, making me think it had dried out a bit. But when we cracked the wheel it had a luscious, runny rind with a firm heart. It was just what I was hoping for, and a great shot of confidence after the downer of my blue.